The Friday before Olympics hiatus was a quiet one..
FOX: The 2-hour HELL’S KITCHEN season finale was steady with last week’s hour at 0.9. CBS: Returning from a week off, MACGYVER dropped 0.1 to 0.9, HAWAII 5-0 stayed at 1.0, and BLUE BLOODS remained at 0.9. 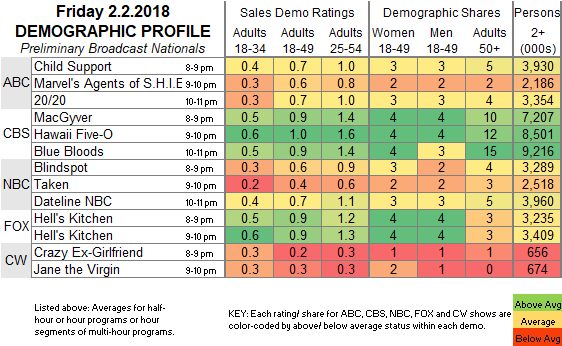 ABC: CHILD SUPPORT (0.7) and AGENTS OF SHIELD (0.6) were steady, and 20/20 was down 0.1 to 0.7. NBC: BLINDSPOT (0.6) and DATELINE (0.7) were as is, but between them, TAKEN fell 0.1 to a new low 0.4. CW: CRAZY EX-GIRLFRIEND was steady at 0.2, and JANE THE VIRGIN gained 0.1 to 0.3. Tonight’s SATURDAY NIGHT LIVE is hosted by Natalie Portman, with musical guest Dua Lipa. On Sunday, the SUPER BOWL will be played, with a “very special” THIS IS US afterward, and most competing networks will flee, the exceptions including HBO and Starz.